Nestlé—a major nutrition, health and wellness company— seeks to enhance the quality of life and contribute to a healthier future. Our ambition for the planet is to steward resources for future generations, which guides our work toward achieving our 2020 commitments and supporting the United Nations Sustainable Development Goals. WHY IS NESTLÉ MEASURING FOOD LOSS AND WASTE? Nestlé is committed to further playing its part in helping to reduce food loss and waste. This helps the company secure supplies of agricultural raw materials it requires, as well as having a positive impact on society by supporting rural development, water conservation, and food security. This is in line with Nestlé’s “Creating Shared Value” approach to doing business. We are continuously making efforts to improve the environmental performance of our operations in order to preserve natural resources and to be successful in the long term. Since 2006, Nestlé has reduced total waste for disposal* from its factories by 77 percent. With 182 Nestlé factories achieving zero waste for disposal at the end of 2016, we are now working toward zero waste for disposal in our sites by 2020. We measure food loss and waste to track progress against our targets. * Waste for disposal: Any material that leaves a site and is destined for final disposal with no economic or ecological value. It includes landfilling and incineration without energy recovery. In 2014, to further understand and reduce the waste occurring in our value chain, we initiated a milk loss and waste mapping exercise in Pakistan, applying the draft Food Loss and Waste Accounting and Reporting Standard. Reporting our data in conformance with the FLW Standard has been a valuable process that allowed us to identify quantities and destinations for each type of milk loss and waste along the value chain. The Pakistani dairy sector was chosen because of its complexity, the high volumes involved, and because it provided an opportunity to test the efficiency of our dairy hub model. 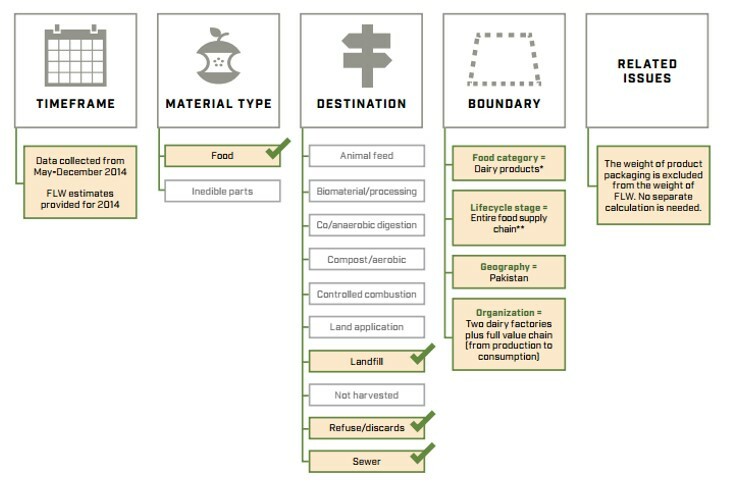 Working with external consultants, we mapped the value chain from farms to consumers. In total, Nestlé processes 480 kilotonnes of milk a year, sourced mainly from traditional small farms but also some larger operations. Before reaching our factories, the milk transits through village milk collection and chilling centers. After processing, 90 percent of it is sold through traditional trade channels to consumers. For each stage of the value chain, we analyzed all potential causes of loss and waste. Losses and waste were quantified (either through direct observation or interviews with farmers, retailers, consumers, and others) and extrapolated across the value chain. To overcome the challenge of measuring food loss and waste in a complex value chain in Pakistan, we conducted a detailed mapping across the entire value chain (from farms to consumers). This allowed us to define more precisely the scope and to identify the main food loss and waste sources and destinations. To overcome the challenge of measuring milk loss and waste in the farming stage, we conducted a sampling exercise during field visits and linked the observations with the interviews of people working in the field, professionals (vets), and dairy experts. The estimates were then extrapolated to a larger sample (of same farm size and practices) and then to the whole country. WHAT ACTION HAS NESTLÉ TAKEN AS A RESULT OF MEASURING ITS FOOD LOSS AND WASTE? The total milk loss and waste across all stages of the value chain was estimated to be only 1.4 percent of milk produced. About 40 percent of the losses and waste were generated at the farm level stage. This is significantly lower than an estimate reported in an Asian Development Bank study in 2004. That study found that approximately 15 to 19 percent of milk sold by Pakistani farmers was lost or wasted en route to market. Implementing lean management and problem solving methodologies to identify, reduce, and report losses and waste from farm to factory. Losses could be reduced even further through improved management of products at the retail stage. For more information on our actions related to food loss and waste, please see our “Nestlé in Society” report at www.nestle.com. The following figure visually represents the scope of Nestlé Pakistan’s milk loss and waste inventory using the FLW Standard. While all possible types of destinations were assessed in the inventory, only landfill, refuse/discards/litter, and sewer/wastewater treatment were considered as milk loss and waste. **Five stages (ISIC codes): 0141 – Raising of cattle and buffaloes; 1050 – Manufacture of dairy products; 4912 – Freight rail transport; 4721 – Retail sale of food in specialized stores, and 9820 – Undifferentiated service-producing activities of private households for own use. on farms (which are outside of Nestlé’s operations) all the way to the point of consumption. Related issues: Weight of packaging is excluded. No calculation was needed to separate packaging weight from food loss and waste. treatment process. The weight of the remaining sludge is included in this inventory. a Additional details have been published in the Journal of Cleaner Production. The case study is titled “Measuring food waste in a dairy supply chain in Pakistan.” It is available at: <http://www.sciencedirect.com/science/article/pii/S0959652616321473>. b For losses and waste of powder milk in downstream transit losses and market returns, the estimated volumes were expressed in fresh milk equivalent. This means that a conversion factor of 7.7 was applied to the weight of powder milk. This case study was submitted by Javiera Charad (Nestlé) and Hélène Lanctuit (Nestlé) with input and review by Liz Goodwin, Craig Hanson, JP Leous, and Kai Robertson (representatives of WRI), as well as FLW Protocol Steering Committee representative Scyllia Ahlouwa (The Consumer Goods Forum). The Food Loss & Waste Protocol (FLW Protocol)—a multistakeholder partnership— has developed the global Food Loss and Waste Accounting and Reporting Standard for quantifying food and/or associated inedible parts removed from the food supply chain—commonly referred to as “food loss and waste” (FLW). World Resources Institute (WRI) serves as the FLW Protocol’s secretariat.